Digital health innovations and applications, including virtual doctor’s appointments and smartphone health apps, can help us live better and longer lives. But many rural Californians don’t have access to these services as access to broadband internet and access to health care is rapidly becoming one and the same. More than 5 million Californians live in rural areas and many don’t have enough doctors in their communities, as few as 43 primary care physicians per 100,000 people. Some rural residents are forced to drive hundreds of miles for specialty care. Modern broadband communications networks and technologies can help bridge this gap, connecting patients though videoconferencing, remote patient monitoring and electronic messaging. With a tablet or smartphone, patients can virtually see doctors or specialists across the state. With mobile apps, patients can monitor a chronic condition and send real-time data to doctors for assessment and follow-up. This not only brings quality care to rural patients, but it also saves patients and caregivers time and money. Eric Brown is CEO of California Telehealth Network. (Techwire) -- As technology becomes more integrated in our everyday lives, it seems the line separating those who have Internet access and the individuals who don’t is becoming more apparent. Looking to help close this digital divide, the University of California-Riverside (UCR) plans to open a new Center for Broadband Policy and Digital Literacy. The university is the only UC in inland Southern California, a rural-next-to-urban region where the the divide is especially evident. Part of UCR’s School of Public Policy, the Center for Broadband Policy and Digital Literacy will tackle digital inclusion issues occurring in the inland area and assist the California Emerging Technology Fund (CETF) by expanding broadband policy research in the state. In development since early 2015, the center was co-founded by Lloyd Levine, president of Sacramento-based consulting firm Filament Strategies, and university Dean Anil Deolalikar. Levine is a former state Assemblymember. In an interview with TechWire, Levine spoke on the project’s progress, future steps and the purpose behind building a Center for Broadband Policy and Digital Literacy. “I see us providing great benefit to policymakers by providing real-world scientific research on exactly what the digital divide is and what it means to be on the wrong side of the digital divide,” Levine said. In San Mateo County, right between San Francisco and Silicon Valley, 25 percent of Latino families cannot afford a home computer, do not have internet at home and are disconnected from the digital economy that makes our region hum. I know this because I am executive director of the Chicana/Latina Foundation, which since 1977 has worked to empower Latinas through education and training. Although I have seen great strides made in internet connectivity and digital literacy over the past decade, Latinos are still too far behind. Without home high-speed internet and computers, schoolchildren cannot to do their schoolwork, parents cannot communicate with teachers, adults cannot apply for jobs and seniors cannot connect to health services. And with every passing day, that digital divide is widening because advances in technology — invented right here in the Bay Area — are leading to socioeconomic opportunities in which the under-connected cannot participate. Silicon Valley companies and philanthropies should be ashamed that so little attention is paid to this Latino digital divide, which is right at their doorstep. But there is much that can and should be done quickly. According to the California Emerging Technology Fund’s 2016 Survey on Broadband Adoption in California, the reason so many Latinos are under-connected is cost. It is simply too expensive for families making minimum and low wages to pay both for a home computing device and high-speed internet, along with a cellphone and a monthly data service plan. Think about it: Owning a computer and a smartphone and paying for internet service on both of them sets you back hundreds of dollars per month. Now imagine if you were making minimum wage working in a Bay Area restaurant. After rent, food, commuting and child care and health care costs — would you really be able to afford a Chromebook and monthly broadband? Probably not. The United Nations has declared access to the internet a human right, but here in California, one of the richest and most technologically innovative places in the world, access is still a glaring problem. That’s why Silicon Valley companies and foundations must get in the habit of giving away hundreds of thousands of free computers every year to the low-income people in their backyards. The recent $10,000 donation, along with 400 laptops, from the Chan Zuckerberg Initiative to Redwood City schools is a small but important start. Silicon Valley companies and foundations must also reach out to the many community-based nonprofits working to provide low-income Californians affordable computers and broadband. Large internet service providers like AT&T and Comcast offer low-cost monthly internet, but they also require consumers to fill out many complicated forms. Nonprofits like the Chicana Latina Foundation and Mission Economic Development Association know how to help low-income people take advantage of these affordable offers, but they need staff and resources to help navigate the process. Community-based organizations are the trusted messengers that can make a difference in closing the digital divide. The fact is getting Latino Californians fully connected to our digital economy and society is absolutely within our reach. But it will require corporate beneficence, smart philanthropy and funding for community-based nonprofits. Let’s get this done and see more boats rise on our increasingly digital sea. Olga Talamante is a Chicana political activist and the executive director of the California-based Chicana/Latina Foundation. She lives in Pacifica. BOYLE HEIGHTS — A major commitment from AT&T will bolster the ConnectHome initiative’s drive to close the digital divide for low-income families through a low-cost broadband program. Access from AT&T, a public-private effort, will help connect families living in public housing projects to low-cost Internet service. U.S. Department of Housing and Urban Development Secretary Julian Castro, Los Angeles Mayor Eric Garcetti and local elected officials were on hand Sept. 7 to formally announce AT&T becoming a national stakeholder at Estrada Courts, the public housing project in Boyle Heights. ConnectHome is an initiative to extend affordable broadband access to families living in assisted housing units. Through ConnectHome, Internet service providers, nonprofits and the private sector are offering broadband access, technical training, digital literacy programs and devices for residents in assisted housing units in communities across the nation. Castro said the Internet is not a luxury, but rather a necessity that helps youths compete. This is the second of a two-part series on the digital divide. Part one can be found here. Why is the Digital Divide a matter of public policy? The answer is simple: Since the turn of the new millennium, high-speed Internet access has become crucial to business, education, health and civic life. Digital access and inclusion are 21st-century social justice and equity issues. Like the electricity grid, railroads, and the Federal Highway System, broadband infrastructure is a necessary public and private good. Because so much of modern life is dependent on being connected, the California has a compelling state interest to ensure that broadband access is available and affordable to everyone. Recognizing this, the California Legislature has enshrined in statute a goal of 98% broadband access by 2017. 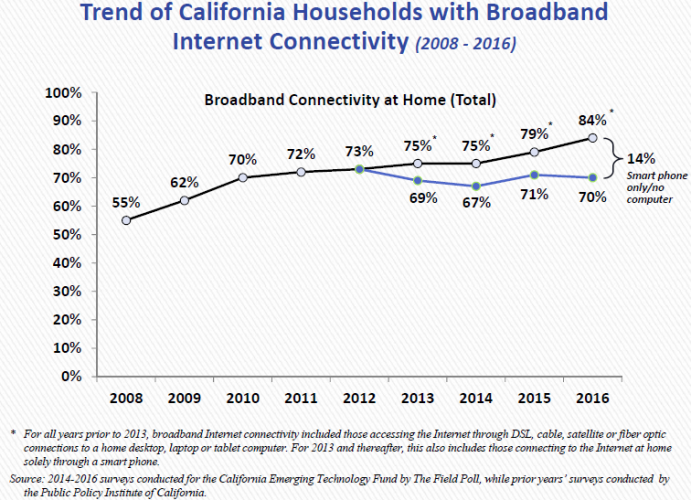 Yet California is falling short of that goal, especially in rural areas, where the California Public Utilities Commission (CPUC) estimates only 43% of rural households have access to reliable broadband service. While the private sector has connected 70% of the state, that number has leveled off. To bridge the rest of the divide, the public and private sectors must work together.